Panasonic expands its TZ series of trazel zoom cameras with the new DMC-TZ7 and the DMC-TZ6 models. 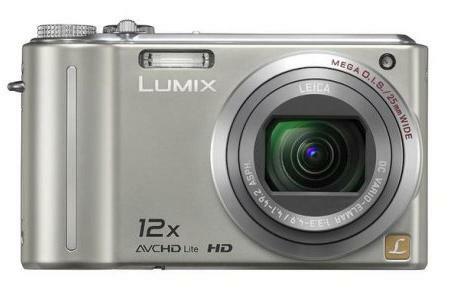 Hands-on test: Panasonic's new 12.1-megapixel DMC-TZ7,is equipped with a 10-element LEICA DC 25mm lens. It's a hybrid camera capable of taking 720p-resolution videos using the AVCHD lite codec, and will feature a 12x optical zoom capable of reaching up to 300mm. The Panasonic TZ series will welcome two new models in April, the Lumix DMC-TZ7 and the Lumix DMC-TZ6 — also known as 'travel zoom' cameras. The 12.1-megapixel Lumix DMC-TZ7, equipped with a 10-element LEICA DC 25mm lens, will be a hybrid camera capable of taking 720p-resolution videos using the AVCHD Lite codec, and will feature a 12x optical zoom capable of reaching up to 300mm. In a hands-on test session with a pre-production model at the launch in Singapore, the DMC-TZ7 captured vibrant and clear images in challenging lighting conditions. It doesn't have a manual mode, so the majority of the exposure settings will be set by the intelligent auto mode, but it is one of the best automatic modes you could want in a compact camera. It incorporates auto focus tracking as well as face detection, both features are a little more advanced than we've seen on other cameras we've tested. The face detection feature allows users to tag familiar faces and give them priority, with the hope of automatically detecting them and focusing on them when they are in the frame (The intelligent auto mode can detect up to 15 faces in the same frame). This feature worked more often than not, and it could end up being a handy feature for parents taking group photos featuring their children — their kids will always be in focus. The tracking feature can be set to focus on moving objects, such as players on a basketball court, or cars on a race track, but it requires a little practice to master, as the zoom lever needs to be manipulated to make sure the object you are tracking is always in range. At maximum zoom, the camera mostly captured clear images — even from a moving bus — which is due to its optical image stabilisation feature. Only fast and jerky hand movements made for blurry images at the camera's longest reach. In dark environments, the Lumix DMC-TZ7 will automatically bump up the ISO speed, but images won't be overly grainy until ISO 800 is reached. As for shutter speed, we were able to capture clear images with a speed as low as 1/30th of a second, but slower shots were blurry. Despite having such a wide ranging zoom lens, our pictures did not suffer from an obvious amount of distortion (or barrel roll). In fact, there was only minimal distortion evident along the edge-most vertical lines. You'll be able to get great reach with the 300mm zoom lens, and it's also useful for macro shots. We were able to get right up close to our subjects and focus from only a couple of centimetres away. It rendered the background out of focus, but with shaped still clearly recognisable,so it won't give you a super-shallow depth of field. Physically, the design of the TZ7 is a little unconventional, with the shutter button is located on the inside of the mode dial. This did cause the mode dial to be shifted out of place — especially on our pre-production models, which had a loose dial to begin with. The custom scene modes and auto mode, as well as intelligent auto mode, can be selected by turning the dial. The custom scene modes are especially useful for changing between regularly used scenarios. These modes should significantly assist photographers when taking specific types of shots — such as night or action shots — but one of our favourite modes was the film mode, which captured classy black and white images with plenty of simulated film grain. The back of the Lumix DMC-TZ7 has a 3in LCD screen, a 5-way controller, and a dedicated record button for its video mode. As mentioned previously, the camera has the ability to record at 720p using the AVCHD lite code, so it's not only a great point-and-shoot, digital still camera, it's also an above average, point-and-shoot digital video camera. A comparison of the AVCHD lite and Motion JPEG video demonstrated the AVCHD lite encoded video's superior clarity and colour saturation. Audio function is not neglected either, as the Lumix DMC-TZ7 has built-in stereo microphones that do a good job of capturing close proximity audio. The digital camera comes with the required software for you to convert your AVCHD footage to DVDs or to prepare them for uploading to YouTube. From our brief hands-on evaluation of this camera, it's set to be one of the best super-zoom, point-and-shoot compact digital cameras on the market. If you've been considering purchasing a new compact camera, it's definitely worth waiting until April to take this for a test drive — especially if you want a digital still camera that will also capture exceptional video footage.